Drainage Pond and Dead Tree, 2018. It is only when you walk around arable land a lot that you really see how industrialised and unnatural much of the countryside has become; there isn’t much room for nature here. This land is very wet, so there are deep drainage ditches and square ponds like this one dotted around among the fields. I took this picture in early October 2018, just as the leaves were starting to fall from the trees. The farmer had recently dredged this pond, and cleared the ditch that drains into it, chopping down, or grubbing out, many small trees in the process. For some reason, this dead tree was left untouched. Working from home, as I have for the past 20 years, you have to keep yourself moving. Most days I try to walk at least a brisk couple of miles, going straight out of the front door, but sometimes, if I have to take the car on some errand or other, I park up and walk from there. Back in October, I found myself near the Leeds and Liverpool Canal, on the Rufford Branch, which heads off north towards the River Douglas and the Ribble estuary, leaving the main canal to wend its way through Lancashire and Yorkshire to Leeds, 100 or so miles away. The combination of industrial architecture, and nature makes canals special. 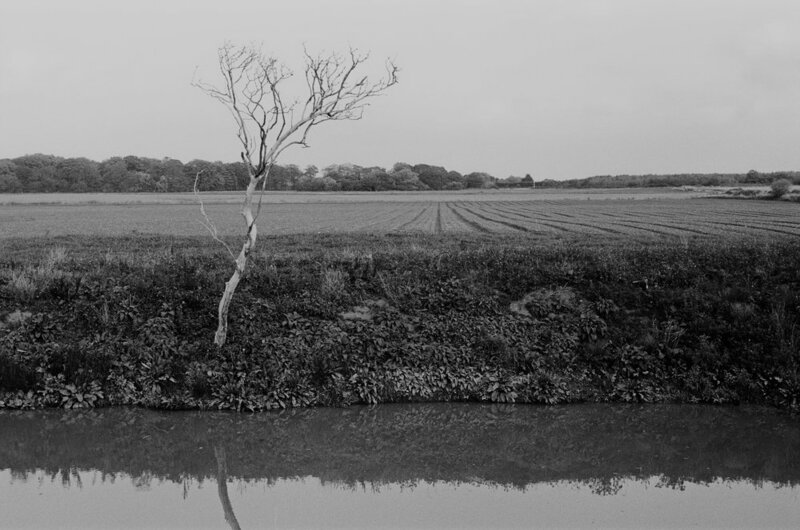 Out here in rural Lancashire, the waterway is a corridor of loose vegetation, a place for birds, and animals, cut through largely flat, intensive farmland. Here the bridges and lock gates seem like interlopers on a natural landscape, but of course the canal itself is a built environment, a remnant of the Industrial Revolution. This section was built in 1781. The Rufford Branch is still navigable, but on this bright morning I saw no boats, only the winter's first geese, and an occasional flash of fish. I used two different Kodak films, TMax 400, and Portra 400, and my favourite camera, the YashicaMat 124G, which takes square images.